2 Mobility Tool Mobility Tool Ne & kim? 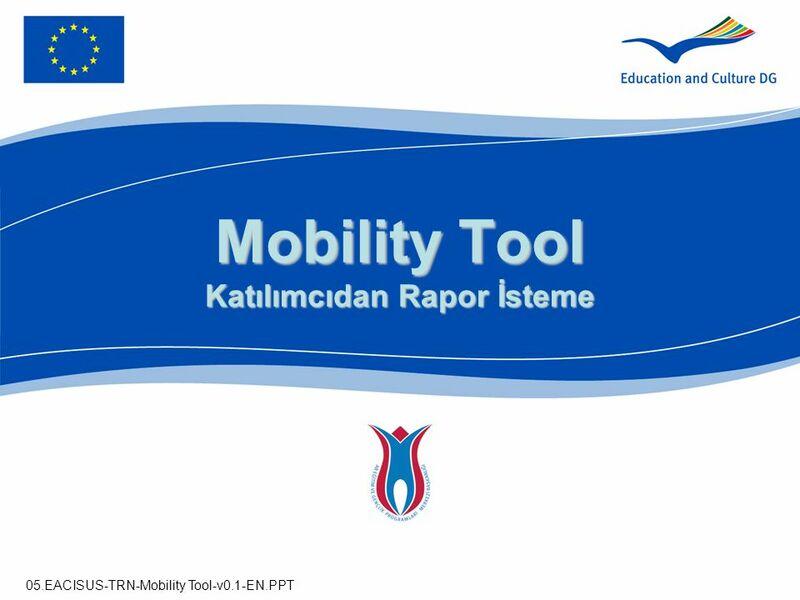 6 Mobility Tool Seçili domain adı «external» ile değiştirilmelidir. 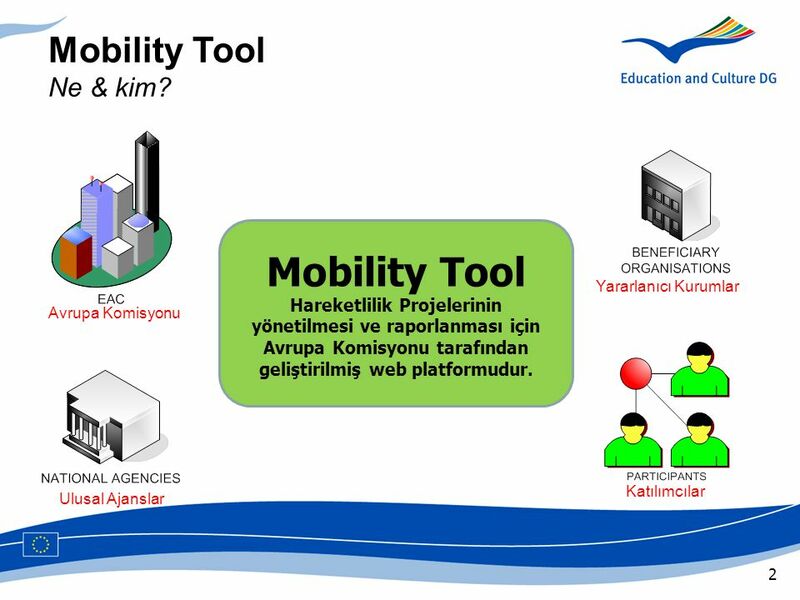 7 Mobility Tool Seçili domain adı «external» ile değiştirilmelidir. 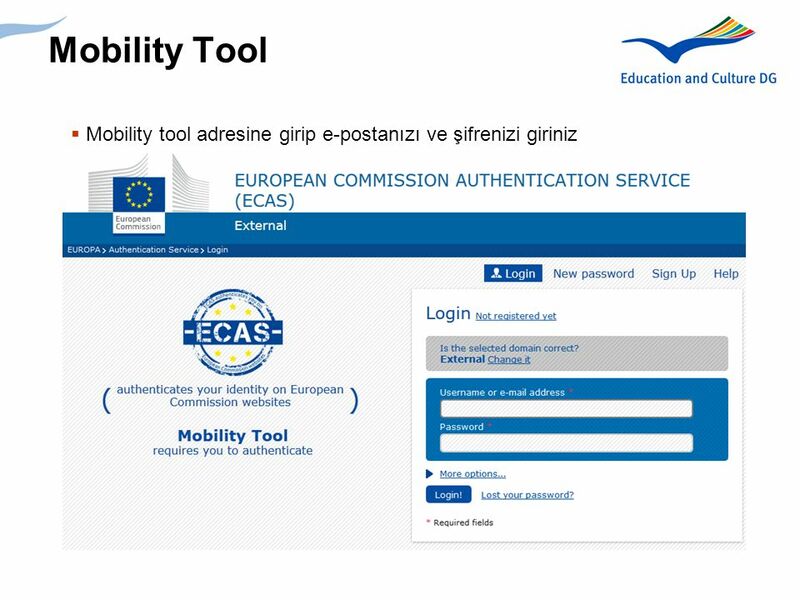 Ekrandaki yönlendirmeler izlenmeli ÖNEMLİ: ECAS için vereceğiniz e-posta adresi ulusal ajansa bildirdiğiniz ve Mobility Tool’a yüklenen temas kişisi e-postası ile aynı olmalıdır. 10 Mobility Tool ECAS tarafından bir e-posta hesabınıza gönderilecektir. Kayıt olma işlemini tamamlamak için belirtilen linke tıklamalısınız. When the NA User has connected, this is the screen he will access. 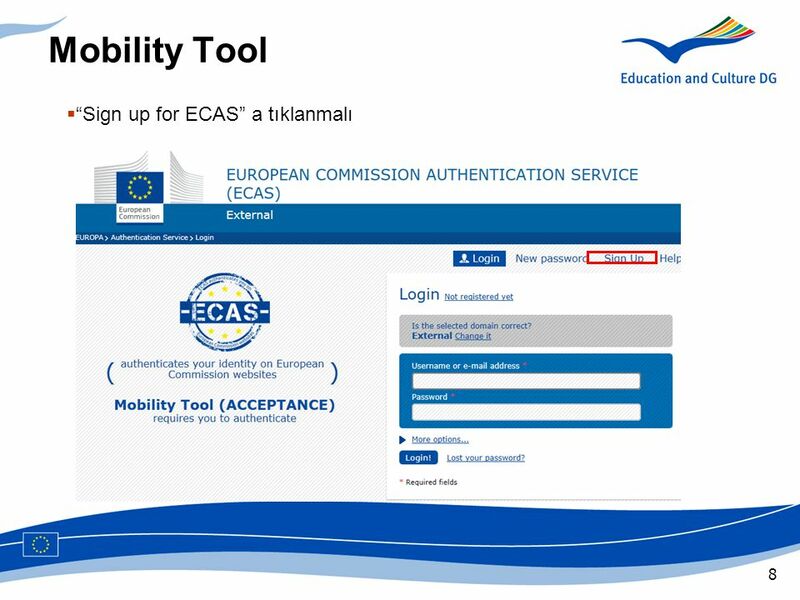 Main Message Explain how the Beneficiary User can register and manage participants. What to present ? The participant is the person who will travel from one country to another country. To add a new participant, the Beneficiary User has to click on the link « Register New Participant ». 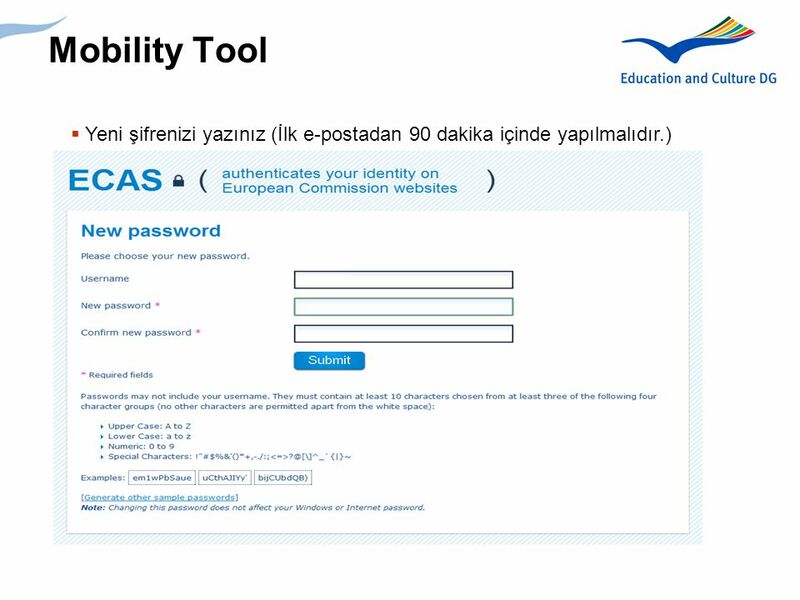 3 tür katılımcı oluşturulabilir - Refakatçi (Accompanying Person) - Katılımcı (Participant) - Engelli Katılımcı (Participant (with special needs)) Main Message Explain how the Beneficiary User can register and manage participants. What to present ? There are 3 different types of participants The participant (without special needs) The participant (with special needs) The accompanying person All the fields with a * are mandatory. The must be a realistic one, because there is a check that is made on the form of the . 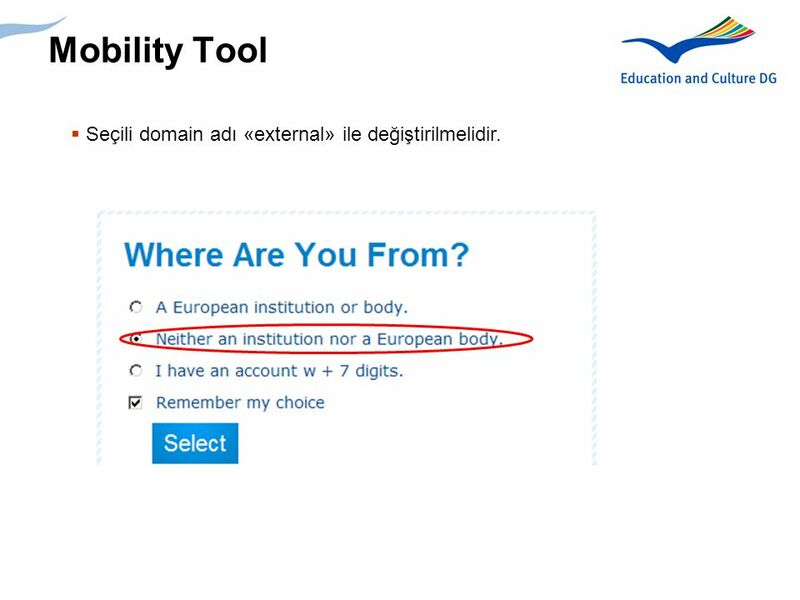 No check on the validity of the (meaning, if it’s an address that doesn’t exist, it will pass). Once the Beneficiary user has completed all the fields, he can click on the button « Save Participant ». Main Message Explain how the Beneficiary User can manage the partners. What to present ? There are 2 ways to reach the page to manage the partners : The Beneficiary user first clicks on « My Home » and then on the link « Manage Parnters » (as in this slide). 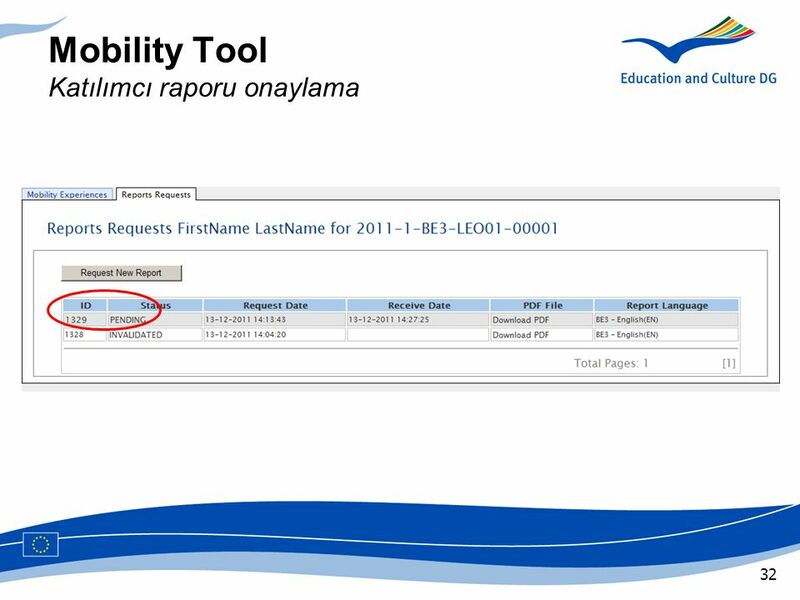 The Beneficiary user first clicks on the project number, and then on the tab « Partners » (as in the next slide). Main Message Explain how the Beneficiary User can add a new partner. What to present ? Once the Beneficiary has clicked on « Add New », he will have to fill in different fields that are splitted into 4 sections (you can see these sections on the bottom of the page). To go from one section to another, the Beneficiary User has to click on the button « Next » . All the fields with an * are mandatory. 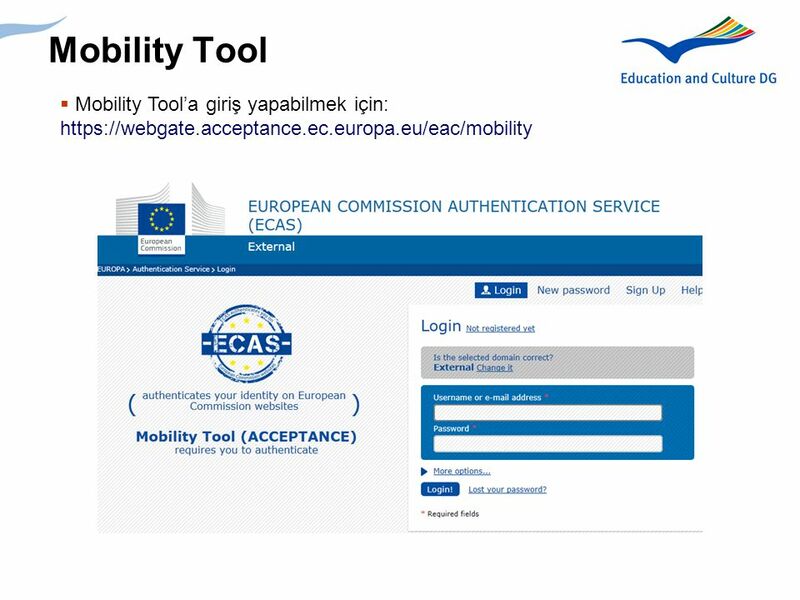 Main Message Explain how the Beneficiary User can create a new mobility experience with 2 mobilities. What to present ? 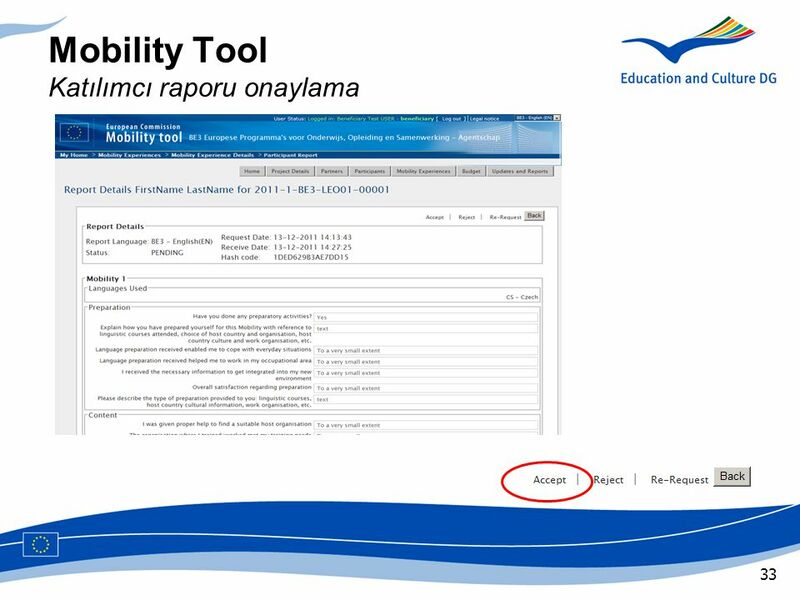 When the Beneficiary User is on the page « My home », he can click on the button « Create New Mobility Experience ». 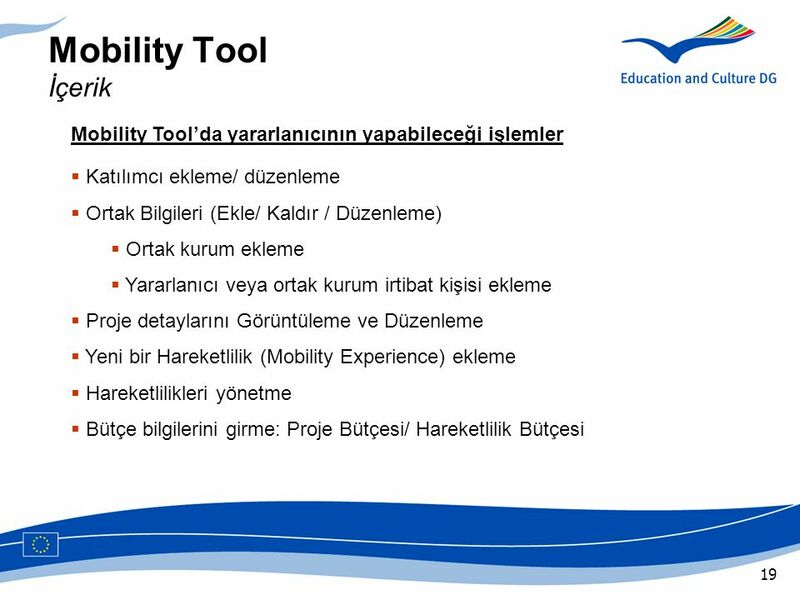 Katılımcılar eklenmiş olmalı, Gönderen ve alan ortak aynı olamaz, Aynı kişi için hareketlilik tarihleri çakışamaz Main Message Explain how the Beneficiary User can create a new mobility experience with 2 mobilities. What to present ? 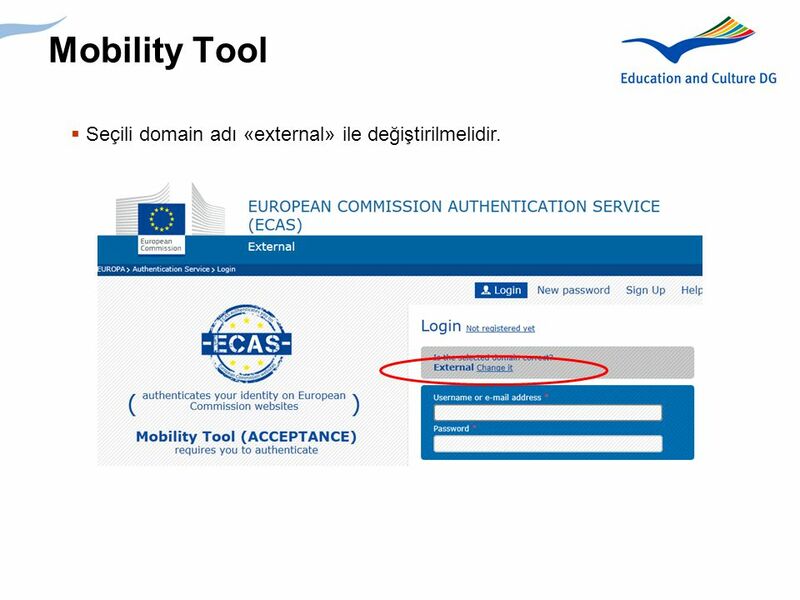 Once the Beneficiary User has clicked on the button « Create New Mobility Experience », he will see this page. The Beneficiary User has to complete the fields (fields with a * are mandatory). The Beneficiary User couldn’t complete some fields if the participant doesn’t exist. 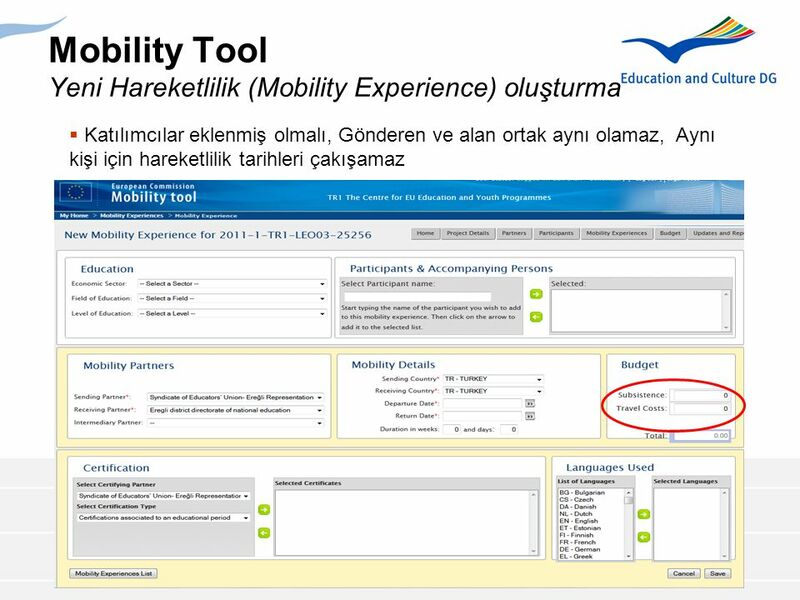 Once the Beneficiary has filled in all the fields, he has to click on the button « Save new Mobility Experience ». Rules Sending and receiving countries can’t be the same. 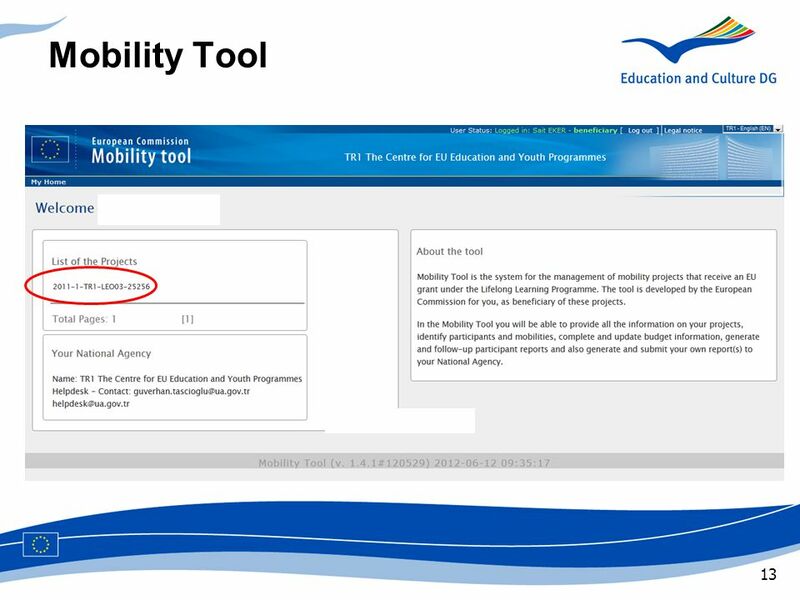 If you create a second mobility for that participant, the dates can’t collapsed. 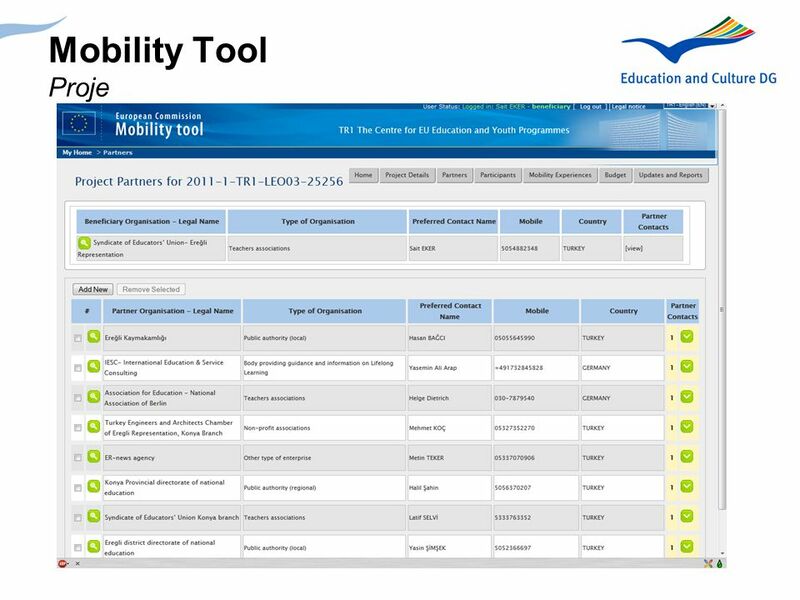 Main Message Explain the user how to manage the budgets of a mobility experience of a project in the Mobility Tool. What to present ? There are 2 kinds of Budget : Project Budget Mobility Budget To manage the Project Budget, the Beneficiary user has to click on the project number. 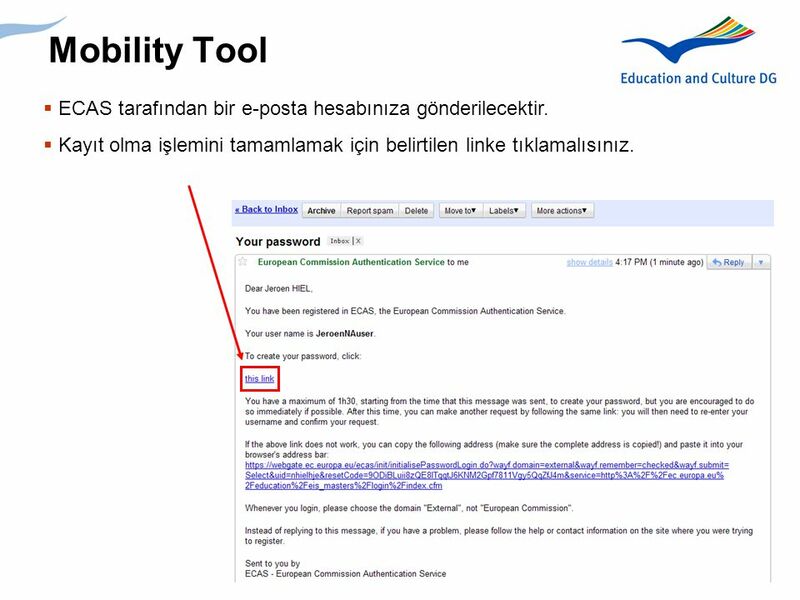 Main Message Explain how to access the page from where you can send a report to a participant. What to present ? No matter if there are 2 mobilities, the user sends ONE report to the participant. The user has to click on the « V » next to the mobility experience. 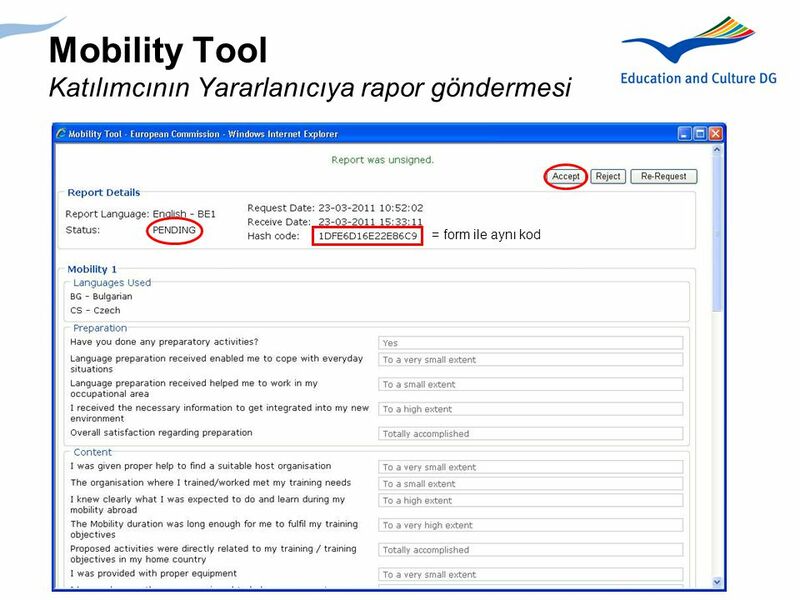 Katılımcı raporu doldurur Bitirince onaylar (validate) Main Message Show the user the report that the participant will receive and that he has to fill in. 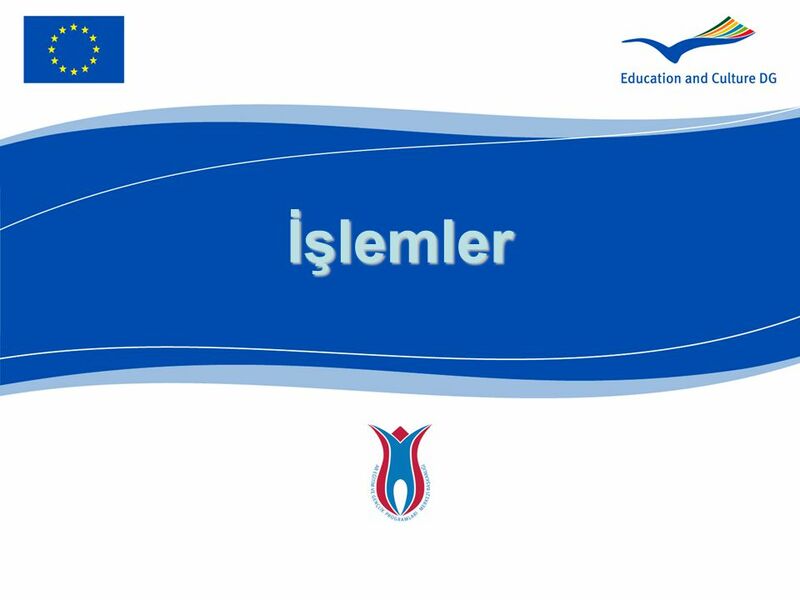 Submit Online Online gönder düğmesine basar, eğer gönderim başarılı ise Submission Status bölümünde «OK» ifadesi yazar. Katılımcının raporu yararlanıcıya iletilmiştir. Formun alt bölümünden «print form» düğmesine basılıp çıktı alınabilir. Main Message Explain the user how the participant will submit this report. What to present ? 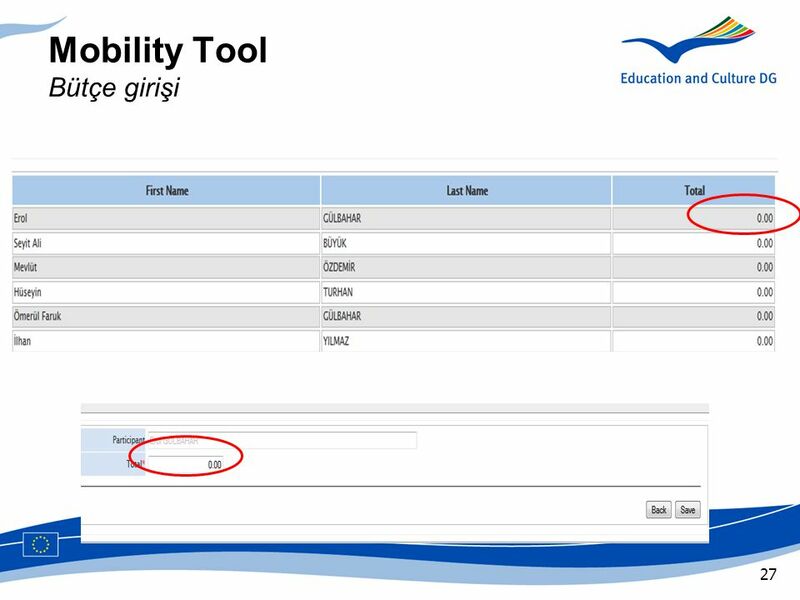 When the report is filled in, the participant must click on “Validate” to be sure that all the fields are correctly completed. Then, the participant has to click on “Submit Online”  when the participant has done this click, the form is sent to the Beneficiary. 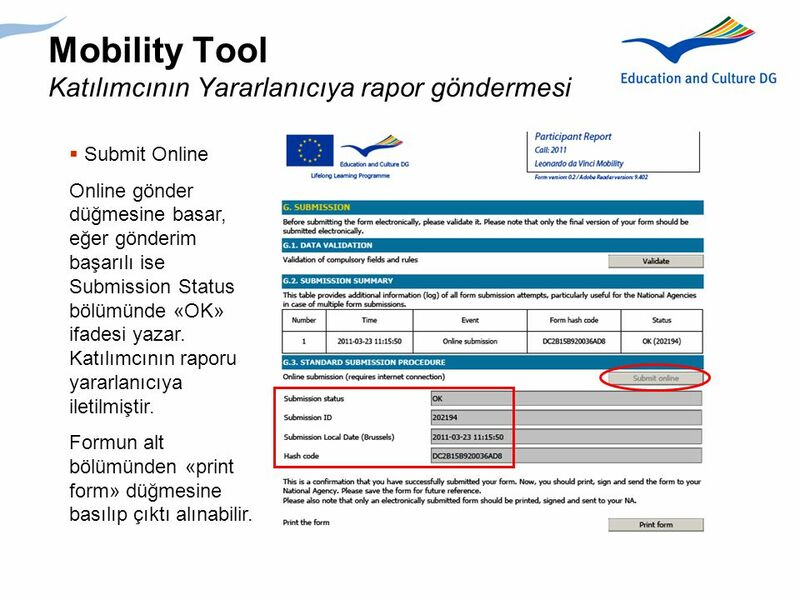 If the submission is successful, the submission status will become “OK” At the end of the form, there is a « Print Form » button, so that the participant can print it and send it the beneficiary organisation if needed. 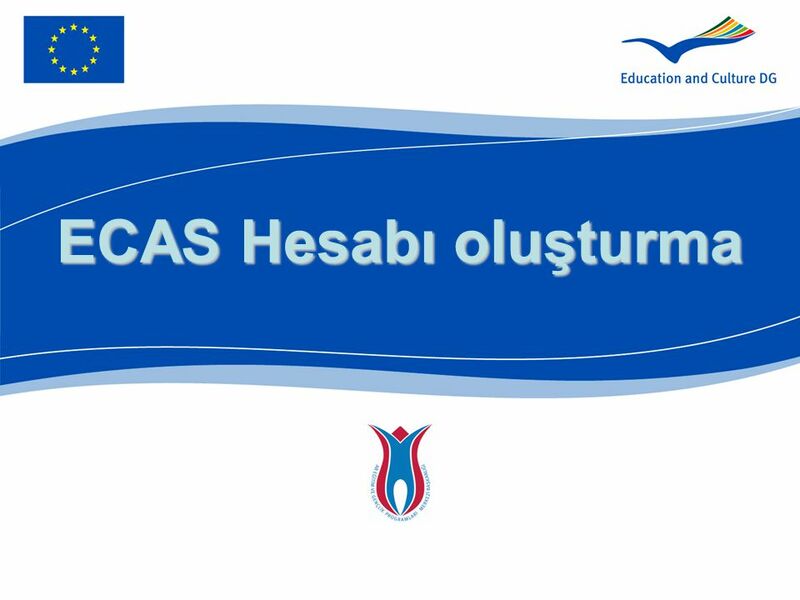 Download the report = form ile aynı kod Main Message Explain what actions can take the Beneficiary user concerning the participant report : accept the report. What to present ? From pending, you can go to: Accepted or Rejected The « hash code » identifies the report. You can only accept reports which are in pending status. If the Beneficiary user clicks on « Accept », he will see a pop-up window where he has to add a comment which will appear in the mail that the participant will receive. 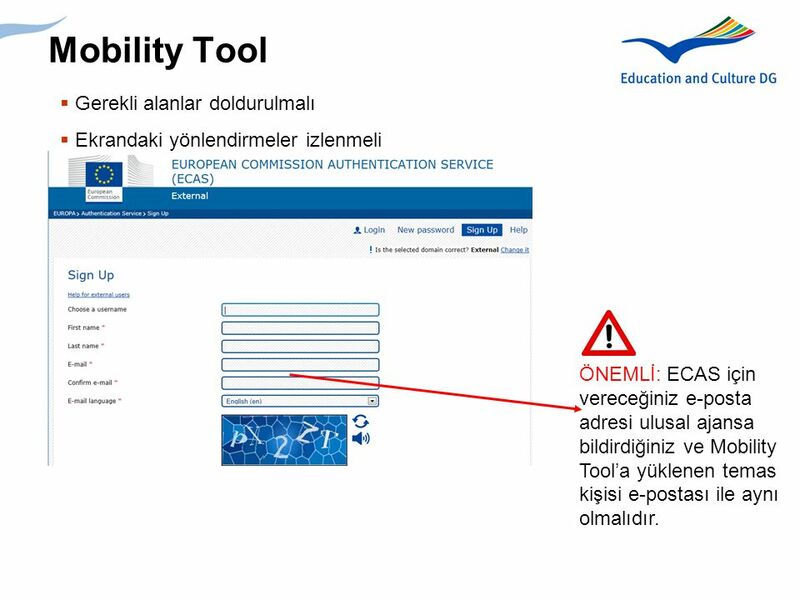 Rapor kabul edilince konfirmasyon e-postası katılımcıya gönderilecektir. Main Message Show the user the mail that will be sent to the participant once his report has been accepted. 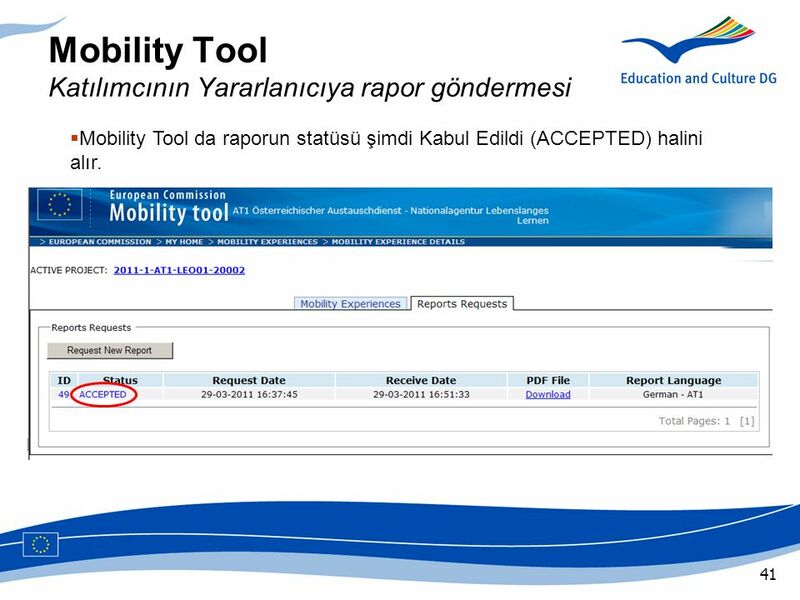 Mobility Tool da raporun statüsü şimdi Kabul Edildi (ACCEPTED) halini alır. 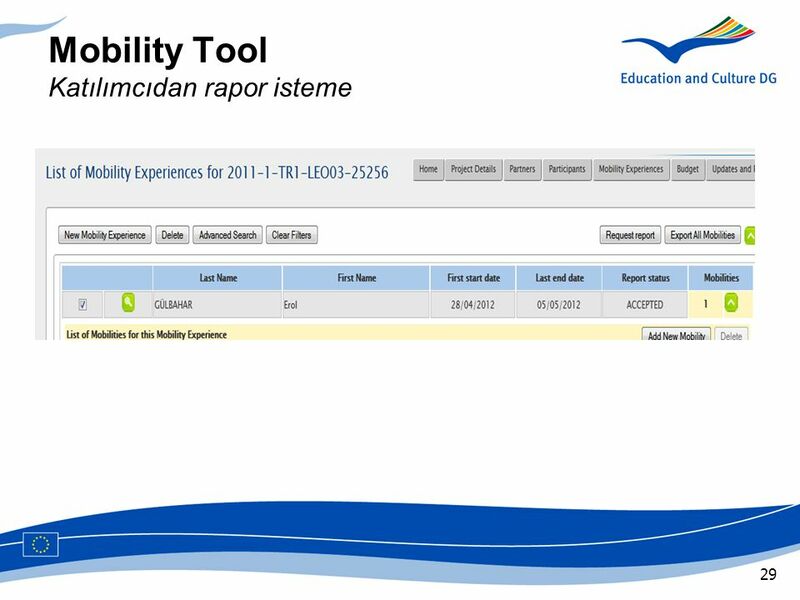 Main Message Show the user that the status of the report has changed once the beneficiary user has accepted the report of the participant. 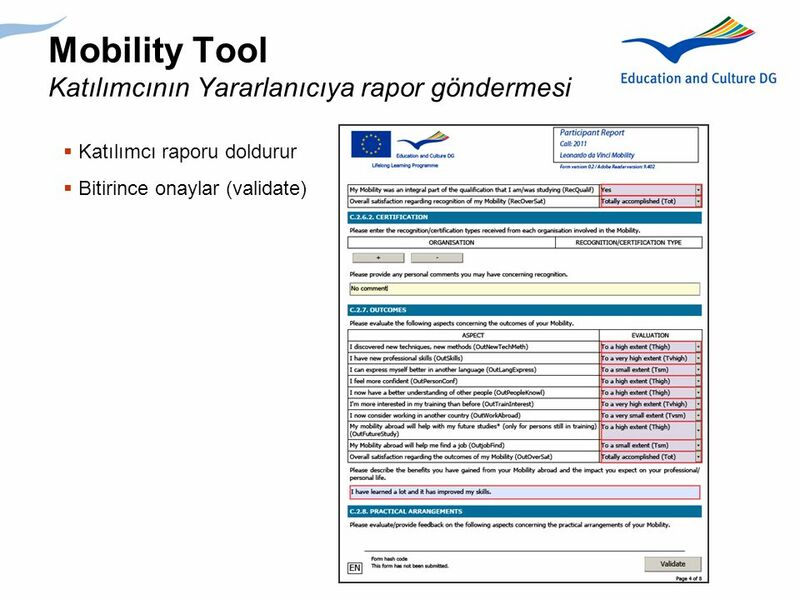 Download the report Main Message Explain what actions can take the Beneficiary user concerning the participant report : reject the report What to present ? From pending, you can go to: Accepted or Rejected. If a report is rejected, the Beneficiary user needs to “re-request” a new report (click on this button in the form). When the Beneficiary user rejects the report, the Beneficiary user can add a comment in the beginning of the report and this comment will appear in the mail that the participant will receive. Rapor kabul edilmezse neden kabul edilmediğine dair mesaj gönderilebilir. 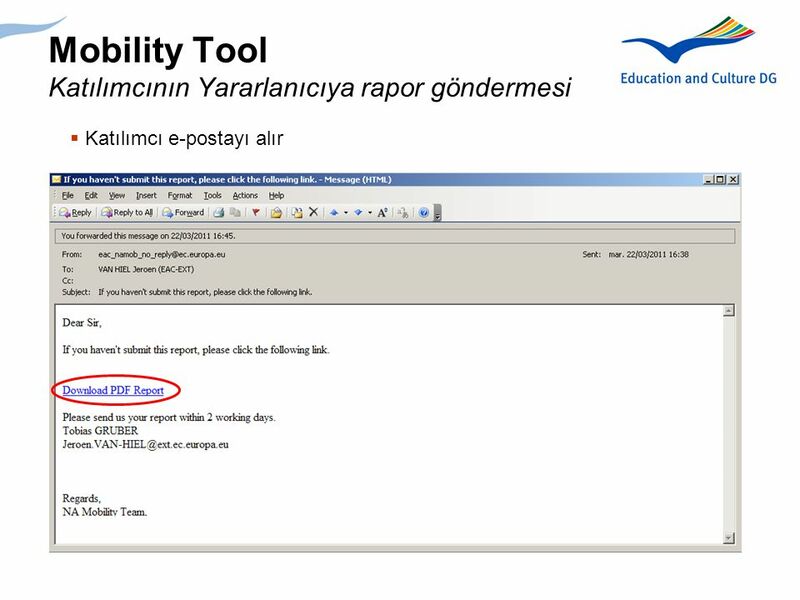 = reason why the report was rejected Main Message Show the user the mail that will be sent to the participant once his report has been rejected. What to present ? The reason for rejection is mentioned in the mail. Raporun reddedilmesinden sonra «Revert to Pending» seçilirse rapor olduğu gibi kalır. Reddedildi statüsü geri alınıp rapor katılımcıya doldurulmuş haliyle gönderilir. 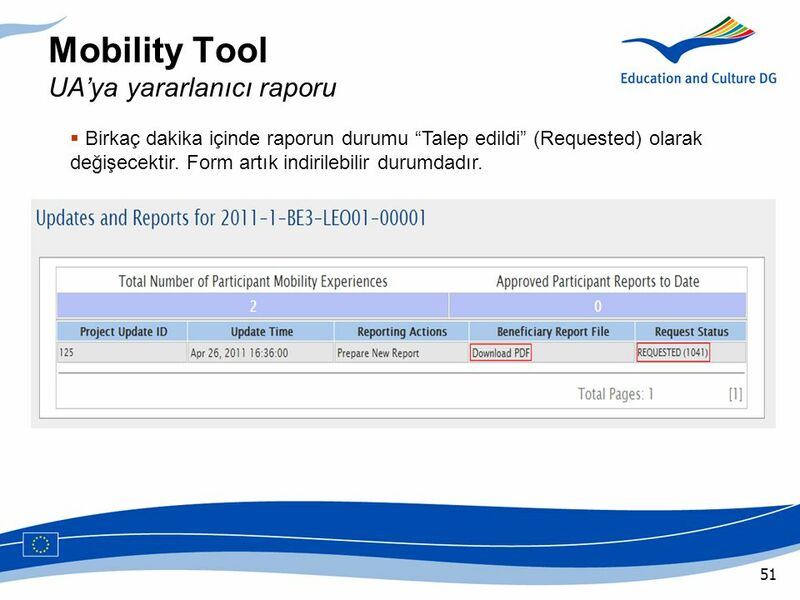 Download the report Main Message Explain what actions can take the Beneficiary user concerning the participant report : revert to pending. What to present ? From rejected, the Beneficiary user can also go back to status Pending by clicking on “Revert to Pending”. In this case, the report is kept as it was. 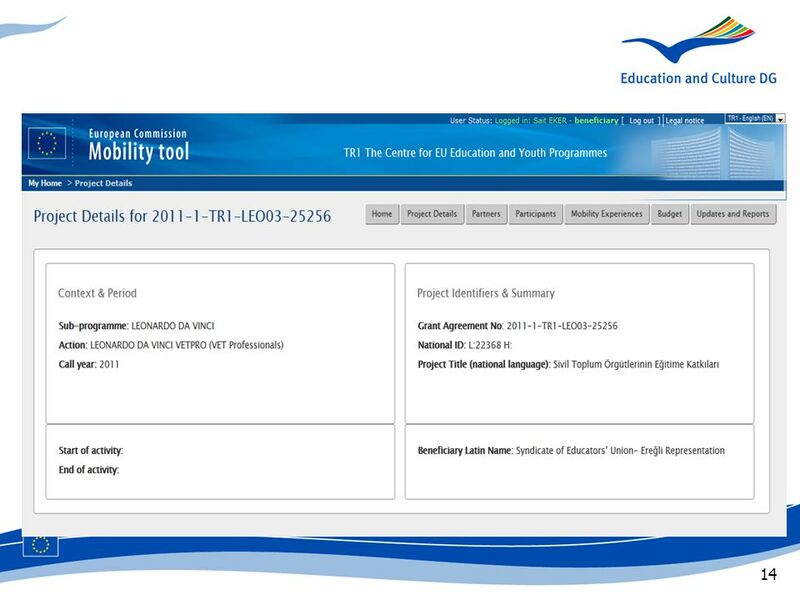 The Rejected status is “Undone” and the report is sent back to the participant (already with all his answers, not only a template). This means that the Beneficiary user can still accept the answers. Raporun red edilmesinden sonra «Revert to Pending» seçilirse rapor olduğu gibi kalır. Red edildi statüsü geri alınıp rapor katılımcıya doldurulmuş haliyle gönderilir. Main Message Explain what actions can take the Beneficiary user concerning the participant report : re-request the report. What to present ? If the report is rejected, the Beneficiary user can re-request it. In this case, the report remains rejected and the report needs to be updated and submitted by the participant (all the fields that the participant already completed will stay completed, he just has to change the things that will be notified in the mail). 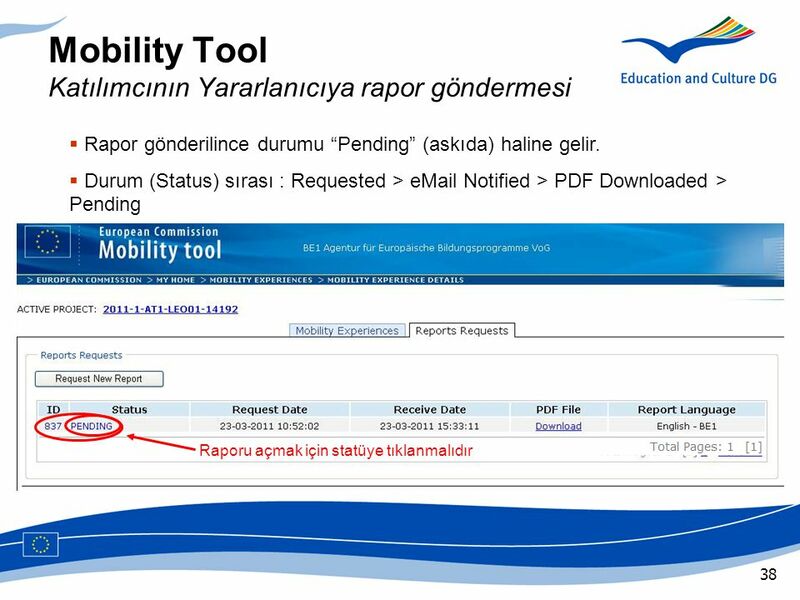 Eğer rapor tekrar talep edilirse (re-request) yeni bir e-posta ile PDF raporun linki gönderilecektir. 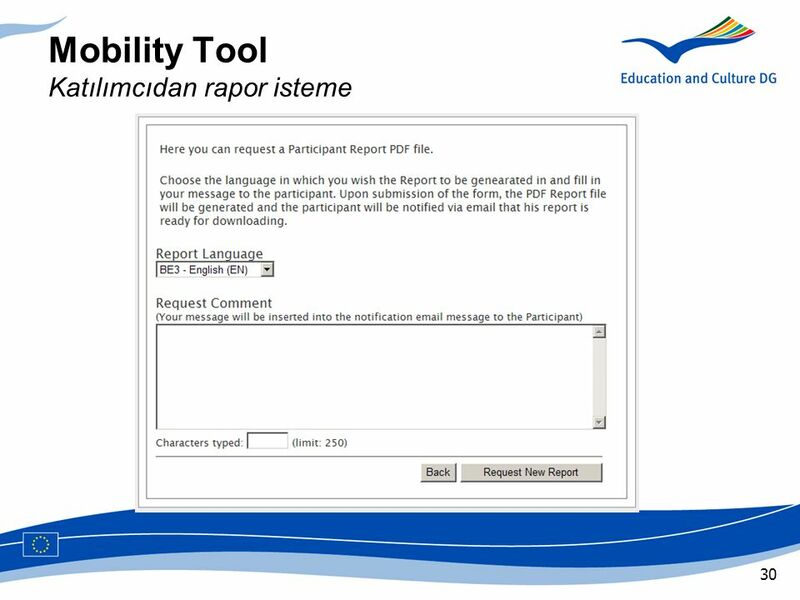 Main Message Show the user the mail that will be sent to the participant once his report has been re-requested. What to present ? ! If the Beneficiary user re-requests, the (previously) filled in report is sent back. So the participant will see his answers and be able to modify them. ! If a NEW report is requested, an empty form will be sent. Another with link to download new report PDF will follow. Main Message This section will focus on the Beneficiary report hat is sent to the NA user. Yararlanıcı Raporu Updates and Reports bölümünde oluşturulur. 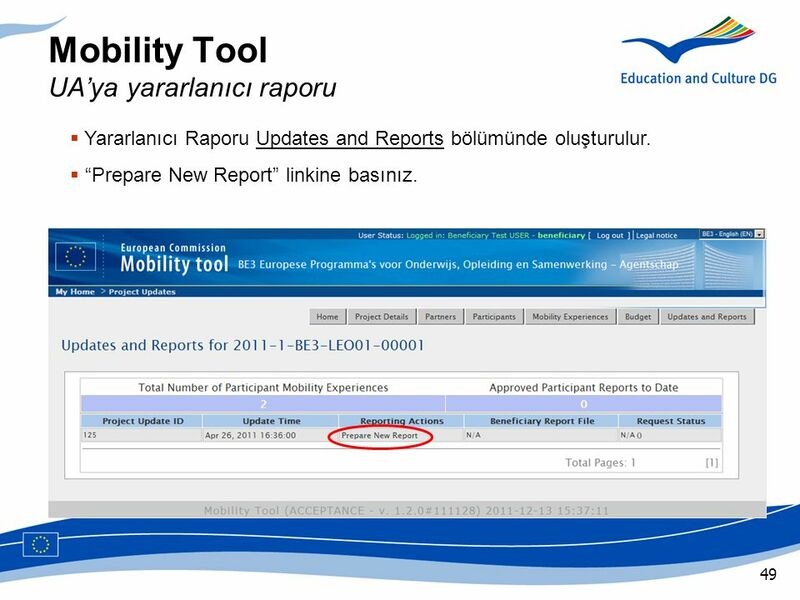 “Prepare New Report” linkine basınız. 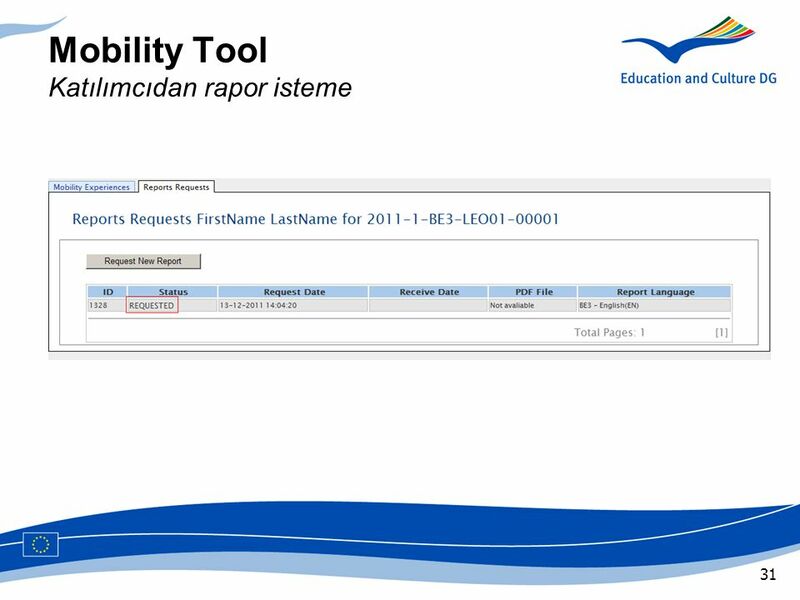 Main Message Explain how to access the page from where the Beneficiary user can send his report to a the NA user. What to present ? The Beneficiary user has to click on his active project. Then, he must click on the tab « Updates and reports ». Once the Beneficiary user is in the tab « Updates and reports », he has to click on « Prepare New report » link. 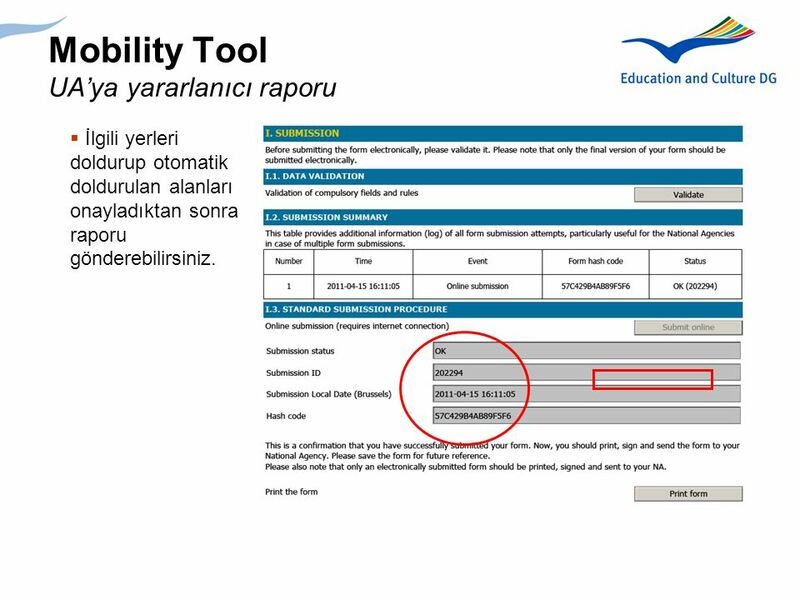 Raporun dilini seçiniz ve Yes düğmesini basınız Main Message Explain how to access the page from where the Beneficiary user can send his report to a the NA user. What to present ? 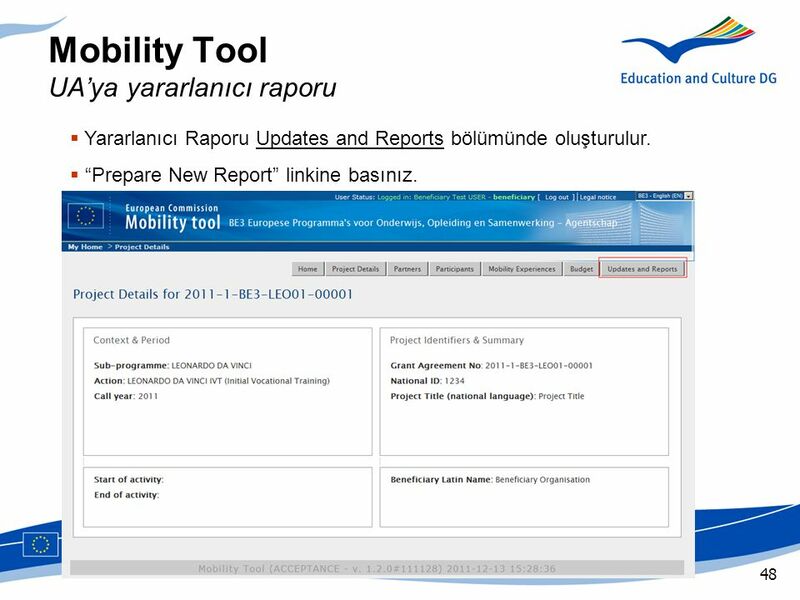 Once the Beneficiary user he has to click on « Prepare New report » link, an extension in this screen will appear where the Beneficiary user has to select the language of the report. 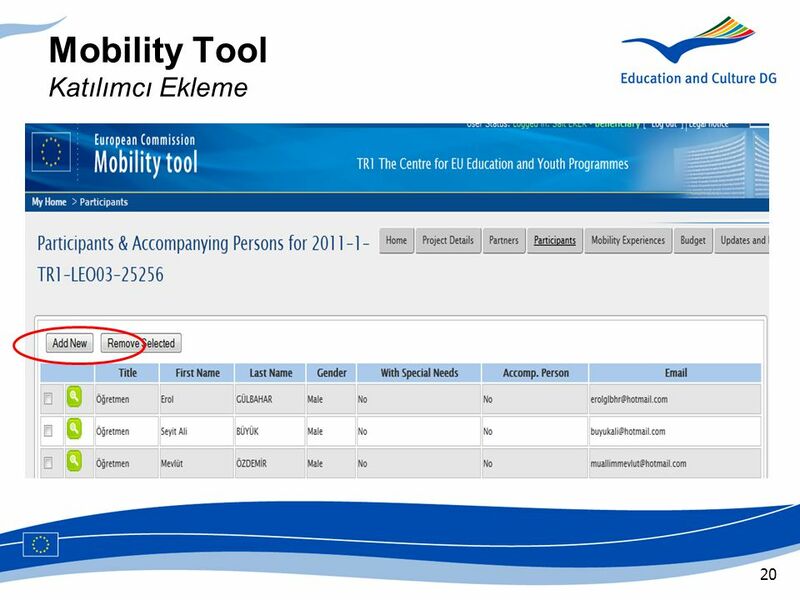 When the Beneficiary user has clicked on « Yes », the system will create a template and will automatically complete all the fields with the information coming for the participant report. Birkaç dakika içinde raporun durumu “Talep edildi” (Requested) olarak değişecektir. Form artık indirilebilir durumdadır. Main Message Explain how to send a report to the NA User. What to present ? Once the request for a new report has been sent, a confirmation message appears in green. İlgili yerleri doldurup otomatik doldurulan alanları onayladıktan sonra raporu gönderebilirsiniz. Main Message Explain the user how the Beneficiary user will submit his report to the NA User. What to present ? 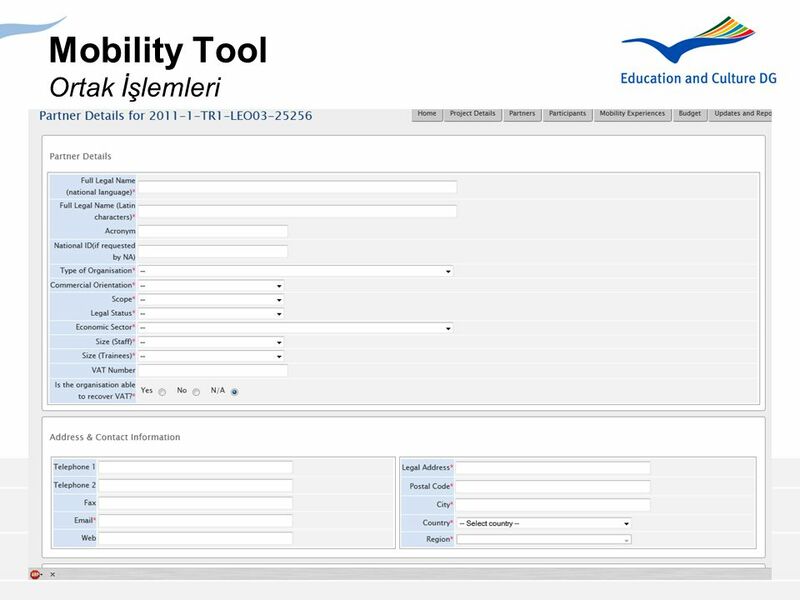 When the report is filled in, the Beneficiary User must click on “Validate” to be sure that all the fields are correctly completed. Then, the Beneficiary User has to click on “Submit Online”  when the Beneficiary User has done this click, the form is sent to the NA User. If the submission is successful, the submission status will become “OK” At the end of the form, there is a « Print Form » button, so that the Beneficiary User can print it and send it to the NA User if needed. Yeni bir bütçe versiyonu LLPLink’de oluşturulacaktır. Rapor çıktı alınır imzalanır ve gönderilir. Raporun «softcopy»sinin gönderilmesine gerek yoktur. 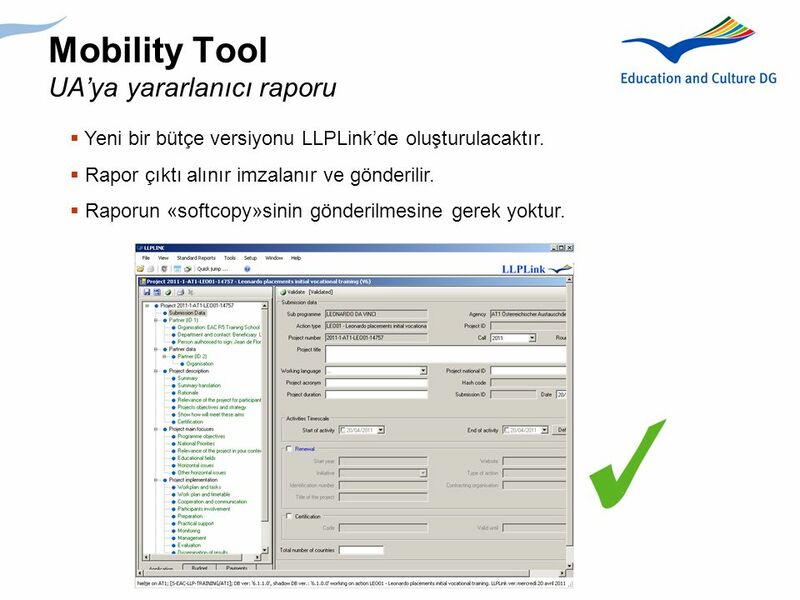 Main Message Explain the consequence in LLPLink once the Beneficiary Report has been submitted to the NA User. What to present ? 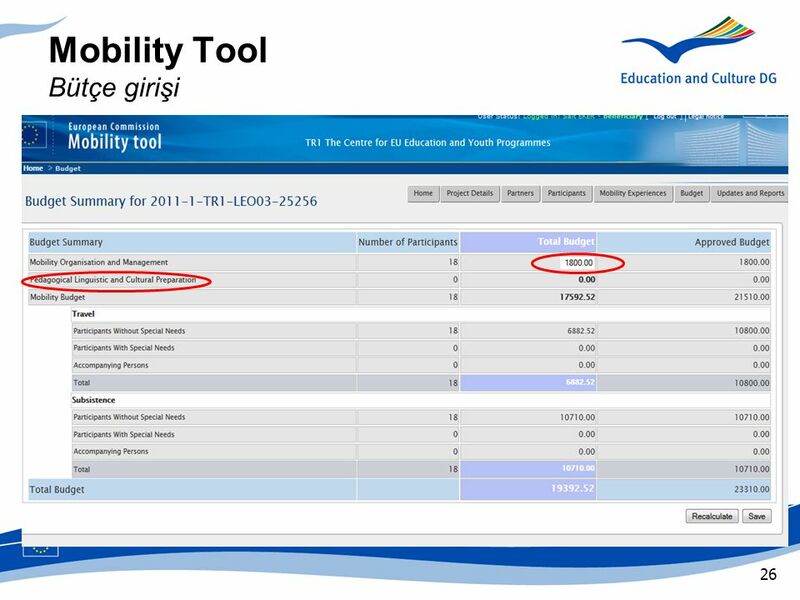 When the report is submitted, a new budget version is created in LLPLink. The NA User doesn’t receive the pdf document in attachment.